The Exclusive Option Leather Stitched Dome Lamp Roof Housing features contrasting stitching around the headliner area of your 911 coupe ehanced with a rich leather surface. This part is an easy install that instantly adds that exclusive look to your cabins roof area. 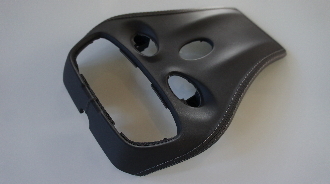 Replace one of the larger pieces of cheap looking bland plastic in your Porsche with one that features intricate stitching with the color of your choice to add that extra finishing touch to your interior. Give your Porsche that distinctive exotic tailored look every time look up.